"Issues you may have had in the past with in-focus on your DOB are history with this new design." MSRP: Camera Package = $399.99 USD, Camera + Monitor Package = $499.99 USD. New!! Introducing the MallinCam Pro Dob II (Patent Pending)! Back in 2005, MallinCam developed a Dobsonian camera with FFM (Front Forward CCD Mount) called the MallinCam PRO Dob. 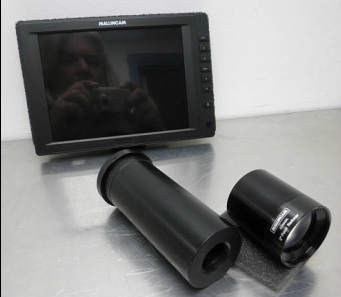 We now introduce a whole new concept that addresses the real issues of using a Video CCD Camera on a Dob. MallinCam PRO DOB II is the answer. Increase your aperture electronically by 3 times instantly in color or black and white (selectable). See details never observed before with an eyepiece. Increase your observing experience and share views with others live! Also included with this entire kit is the MallinCam unique 2" C-mount adapter and a MFR-3 Focal reducer, providing a much wider field of view and allowing the camera to catch the large light cone found on all fast Newtonian/Dobsonians and on larger mirrors with little or no light spillage. The MallinCam MFR-3 Focal reducer can be removed allowing a variety of other focal reducers to be attached through the C-mount threads on the front of the camera. 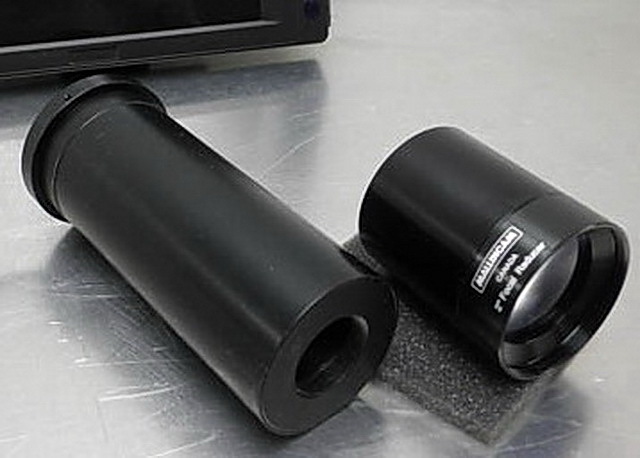 A unique "Focus StopGuard" (trademark) will prevent the entire camera from falling inside the focuser, which can cause serious damage to the secondary mirror and primary mirror. The New MALLINCAM PRO DOB II has a smooth and precise 2" diameter camera body that can slide in and out of the focuser to accommodate the precise focus point of the camera without having to modify the mirror mount or cutting truss tubes to bring forward the camera focus point. Note: A focuser is shown in images for illustration only, not included in camera package. Custom designed and made by MallinCam from aircraft aluminum and black anodized for durability. This new camera concept was designed with a 1/4" thick front mounting plate allowing zero flexture in the system while maintaining perfect focus at all times. A Sony ICX672AKA EXview HAD II sensor is used to maximize image quality with the shortest exposure possible giving exposure sensitivity of 40% increase above any other sensors in its class. Up to 17 seconds exposure is available with instant refresh and up to 5 times image stacking on the fly providing superior noise reduction. Color or black and white selectable among many other features. The New MALLINCAM PRO DOB II includes a 2 meter long wired remote control unit that provides 12VDC input, video out, and RS 485 capability all in one cable, reducing the stress from many separate cables hanging from behind the camera. The camera comes complete with a C-mount MFR-3 focal reducer complete wired remote control (w/ 12 volts dc input, BNC output, and RS 485 ready), and 12 volts car adapter. Sony sensitive EXview HAD II ccd sensor in a 1/3" format can exceed sensitivity up to 40% more than any competitors! ICX672AKA Sensor with micro lens Technology. Stacking Mode is standard for up to 85 seconds frame average on the fly. 32 Bit DSP Micro Processor. Now includes RS 485 ready rear socket camera control. High Resolution: Up to 700 lines resolution in B/W mode and 650 in Color even in low light condition. WDR: Combines two fields which high shutter speed exposure are taking in bright light and low shutter exposure into one composite image to help see dark parts and bright parts of a image. This feature can extend shutter speed above 17 seconds without saturation. A MallinCam unique system. HLI: Electronic coronagraph blocking bright light and leaving dimmer area lit. Day and Night: provide clear images in low light condition. Allow black and white mode and color mode automatically or can be set in either mode manually. AGC: AGC circuit automatically adjust the incoming signal to proper level. Improves performance in low light condition by increasing sensitivity. Extra gain has been made possible only in the MallinCam MICRO video ccd camera not found on competitors. ATW: Auto adjust the white balance or can be adjusted manual. BLC: Ability to balance faint object with bright object. Full GAMMA selection of 0.3, 0.45, 0.6 and 1.0 range. Mirror Function allow image orientation to suite any telescopes.